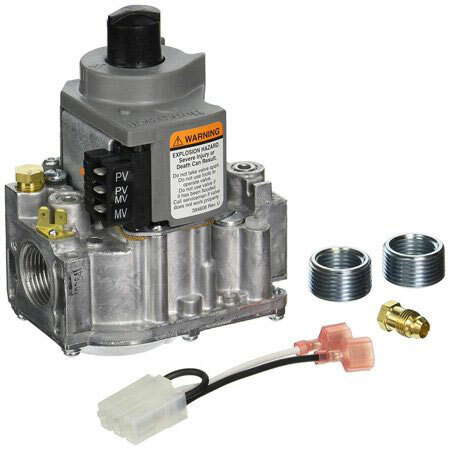 Honeywell VR8345M4302 standard dual direct ignition, intermittent pilot gas valve with direct spark for gas-fired appliances with capacities from 30 to 415 cfh. Control includes manual valve, two automatic operators, pressure regulator, pilot adjustment, pilot plug and ignition adapter. Replaces many IP, HSI, or DSI gas control. For use with natural or manufactured gas or LP gas. Includes converter kit to adapt from natural to LP gas. All adjustments and wiring connections accessible from top of control. Four-inch swing radius allows easy rotation into position inside the tightest furnace vestibules. Clearly marked, keyed terminal block allows quick attachment of wires and IP/DSI/HSI jumper. Internal inlet screen blocks contaminants in gas line from entering valve.